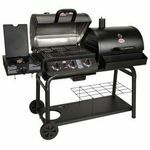 This grill is perfect for family grilling or perfect even for one person meals! Large cooking area for that completely satisfies the needs of our large family of 7! 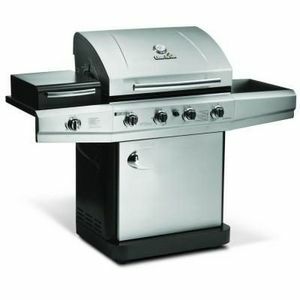 The grilling surface is super easy to clean and also leaves thise awesome grill marks on your steaks and other meats! Sleek design is a perfect addition to our patio and is a a very useful tool for many summertime gatherings! 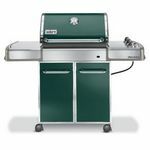 This grill is great for all the family bbq and grilling needs. Has to be replaced already! When we bought our Char Broil grill, we thought it would last a long time. We were wrong. After the first summer of use, we had to replace the burner mechanisms. We've had problems with it ever since! The burners don't always light with a full flame. It takes turning it off and then back on several times to get it to possibly light properly. Very frustrating when your trying to cook a meal for your family! My sister has the same grill and has the same problem. Performance The burners don't always light properly. It works fine if it we can get to light with a full flame. Versatility It's large and hard to move. Because it's wide, it's hard to find a place for it on our deck. Ease of Use When it lights, it's not hard to use. Ease of Cleaning It's very hard to clean. The grates are heavy and you have to keep them seasoned regularly in order to keep them from rusting. Otherwise, the grates are very expensive to replace. Durability It's protected in the winter and covered all summer and it's rusting all over. It's very expensive to get replacement parts. Especially the cooking grates.were trying to get through so we can just get a new grill. Design The back is too wide open. You have to purchase an expensive cover that goes down and around the entire grill top to bottom to protect it from rain getting inside. This is one of the best gas grills I have owned. Its easy to use, has a large grill surface area, and additional burner to use as a stove. With so much area and a shelf, its easy to use this as our only cooking surface and not have to turn on the oven or stove in the kitchen. According to my husband, he gives it a thumbs up, but only one, because his tongs are in his other hand. Performance The grill heats evenly along the burners and quickly. 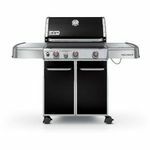 With four burners, its easy to regulate temperatures from one side of the grill to the other. 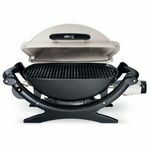 Ease of Use On a regular basis, this grill is very easy to use. My one complaint about the product was setting it up once we got it home. The propane tank wasn't as easy to install as our last grill and we ended up going through our first tank of propane very quickly. Once we got the hang of it, it was easy to change the tanks out. Design Pretty standard grill design, includes rollers that make it easy to move in and out of the garage. This is a great grill that gets very hot! I love having a hot grill to sear meat properly, and this is it. It has very even heat too. I like how the grill grates don't allow food to fall through. Because it is such a hot grill, I can cook on lower heat most of the time, saving propane. I love how the thermometers are right at grate level so I know how hot it is right where the food is. It is important when grilling pizza to know how hot the grate is. I would like a thermometer in the traditional cover position too, one of my only complaints. We bought our char-broil 4 burner propane grill with outdoor stove about years ago. It is very easy to use. The knobs are easy to turn. There are four seperate knobs so you don't have to turn the whole grill on if only cooking a little food. Each knob heats a fourth of the grill. My favorite part of the grill is the outdoor stove on the side. You can put pots or pans on the stove part of the grill. So you don't have to go inside to use stove, if only need one burner, it's great. Each knob has settings that go from low to high and inbetween. Very easy to turn on. Open propane tank and one of the knobs has a starter button, set the knob there and hit the red button. Then the grill is lit. Very easy to clean. If you get food stuck on the racks, I turn the grill to low and brush it with a brush that has metal bristles. I personally find it easier to clean when grill is still hot than when it cools. I have owned this grill for over 3 years and have been completely satisfied with it's performance. It was very easy to assemble and it's very easy to move around. I grill at least once a week and sometimes two. Never had any problems with it's mechanics. For the price you can't beat it! 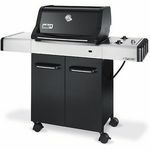 We just bought this to replace our previous Char-Broil grill, which got rusted from being outside too long. So far everything has worked fine. Performance It cooks well, heats up quickly and is easy to clean up. Versatility We really only use it to grill chicken and burgers, but I am sure it would work well for other purposes. Ease of Use The electric igniter makes it easy to start up. Durability It is hard to tell because we have only had it for a few months. It is a nice grill overall, but it has its drawbacks. The covers for the transfer burner lines at the rear of the grill are flimsy and burn away too quickly creating a hot spot at the rear of the grill. So the front of the grill is too cold to cook anything. The porcelain grill tops are a pain to keep clean. That may not be all Char-Broil's fault because there are not a lot of porcelain grill cleaner products on the market that I could find. The side burner is a nice feature, but so far I have never found a use for it. So it goes unused. Perhaps one day I'll create a barbecue sauce that needs to stew while I'm cooking ribs. I have cooked salmon in a foil tray in a nice sauce and perhaps the side burner could've been used to warm that sauce. But if I'm just now thinking about it, the burner still goes unused. I really enjoy the four burners and the large cooking area, which is needed when my children and their families come over for a cook-out. The spark ignighter works well, but now it needs to be replaced and hopefully it will not be a major project.